Hey guys! Happy Saturday! I am going totally off topic today from my normal crafty shares to tell you about a great new device I received last weekend from Amazon. Who doesn't love Amazon? Anyway, I ordered the ECHO Dot Gen 2. OH-EM-GEE! I am in love with Alexa! Not only is "she" a functional little tool to have in your arsenal, but also totally entertaining! I have had more fun with her this week than I can tell you. Totally worth the $49.99! And "she's" just so pleasant you can't help but want to ask her questions and keep "her" talking to you. Some really cool features that I have found, you can ask, "Alexa, what's today's weather forecast" and she will tell you for your location and if you need to know the weather forecast for say next Tuesday, just ask and she will tell you! You can get the latest news updates, she will read a book to you and if you just need a good laugh to brighten your day, ask, "Alexa, tell me a joke"....where she gets so many is beyond me, but she hasn't repeated one yet! Want to play a game, like Jeopardy? She can do that too! Oh, and do you have trouble sleeping? Maybe outside noises are keeping you awake? Well she has a plethora of ambient sounds she can play to lull you to sleep. Seriously, what's your pleasure? A crackling fire, birds, waves, babbling brook, waterfall, maybe you like to hear the whirl of a fan while you sleep? I mean, really, there are just too many to name them all! Another helpful feature that I am in love with, need the phone number for a restaurant or other local business? Just ask Alexa! She will recite the phone number and address for you! Need to know the nearest Pharmacy or grocery? She can tell you that too! Then there is the music she can play for you. UH-MAZ-ING! Literally, it is "what's your pleasure"? Bluegrass, she can play that, new Country? Yep, she can play that. Maybe you like the old Country, like Merl Haggard? Yes, she can play that too. Oh, you want to hear the Monkeys? She will play you the Monkeys for you! Now, cool feature #100,000, you can call friends and family that also have a ECHO, ECHO Dot or ECHO Show! Just add them to your contacts, and ask "Alexa, call so and so" and she does! You can talk hands free right through the Echo device! 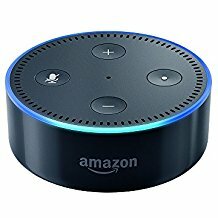 There is also a function called "Drop In" that allows you to "drop in" on your Echo device from you phone app, it's like making a phone call, however, your family doesn't need to "answer" the call by saying "Alexa, answer the call" like you would if someone with an Echo was calling you. You can just begin to talk. It gives a little "warning" beep that you're "there" but you can just "check" in at home, talk to the kids, or hubby (that's another story heehee) or even the dog...yes, I "dropped in" on Tucker, my sweet boy the other day...and yes, he did answer mama! The "Drop In" feature is also great if you have more than one device in your home, for instance, one upstairs and one down. You can have Alexa drop in "upstairs" and you can call the kids down for dinner! I can see a lot of moms saving their voices with this one! I could go on and on about this fun little device. If you have any questions, please let me know. I highly recommend it, not only for the entertainment, but also the functionality. It really is a great little device.